Lawrence, whose falls (the first one at The Oscars clearly faked) (I am a fall truther, come at me) have been recorded in history since 2013, had the hardest time getting back up at the premiere in Madrid last night. According to TMZ, who got the aftermath on video, the actress’s Ralph Lauren dress was “just too much for her” and she went down several times immediately after her initial fall while trying to get her bearings. While this isn’t a particularly bad fall (I’d give it a 7.6), it’s nothing like the time she almost took an entire person down with her at The Oscars in 2014. And now that she’s run the entire gamut of being foiled by gravity, it’s time that Jennifer Lawrence chose something else to charm us with. At this point, it’s kind of like a toddler who can only do one thing and expects the same amazed reaction every time. Despite her brush with the ground, Lawrence eventually got back up and continued her evening. 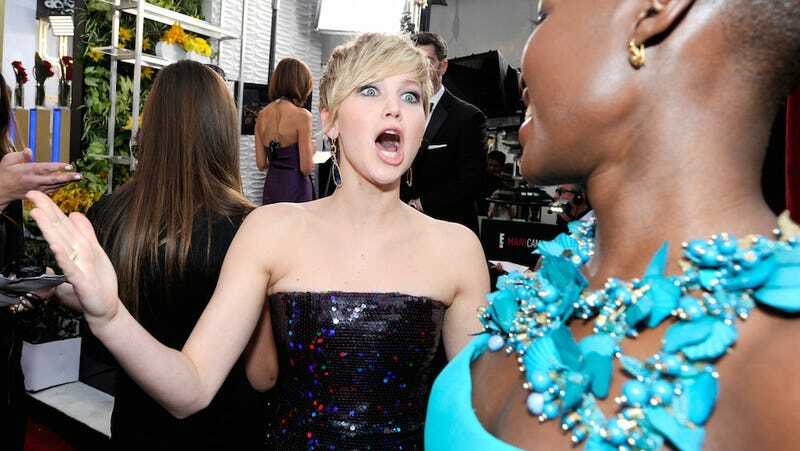 Hopefully, the next time she does something wiiiiiiiiild on the red carpet it involves more pranks and less pratfalls.